Note: e.g. 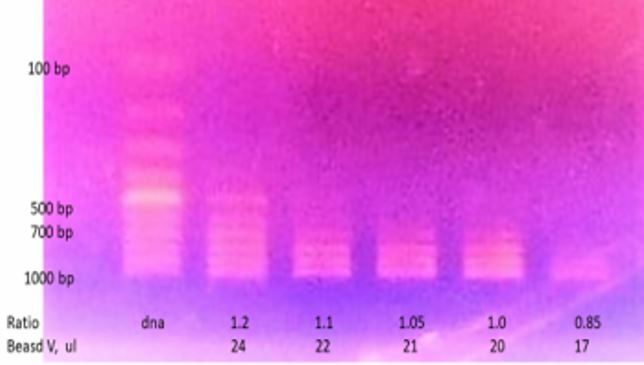 using 20 ul of 50ng dna with a volume ratio of 1.0 or 20 ul bead solution K61001-700 to having dna sizing Cut off 100 bp~600 bp , and select 700 bp and higher dna. Air dry the beads for 2~5 min. Table 1. General guidance for the ratio of MagVigen™ solution vs. DNA sample solution to achieve desired DNA size cut off (400~700 bp, with ratio 1 +/- 0.05 to have 700 bp size selection). One can titrate different ratio to identify the best condition.